With the arrival of Margrethe Maersk, CMIT, located downstream Cai Mep River of the southern province of Ba Ria-Vung Tau, is the first port in Vietnam and the 19th in the world to be able to handle an 18,300-TEU Triple-E vessel, according to the Sai Gon Giai phong (Liberated Saigon) daily. Margrethe Maersk, built by Danish container shipping company Maersk Line, is 399.2 metres long and 59 metres wide and has a deadweight tonnage of 194,000. Triple-E is a class of the world’s largest container ship at present. The name is derived from the three design principles of economy of scale, energy efficient, and environmentally friendly. In recent years, about 30 percent of Vietnam’s containers destined for faraway markets had to transit ports in Hong Kong (China), Singapore or Malaysia, which has added to delivery costs and time. 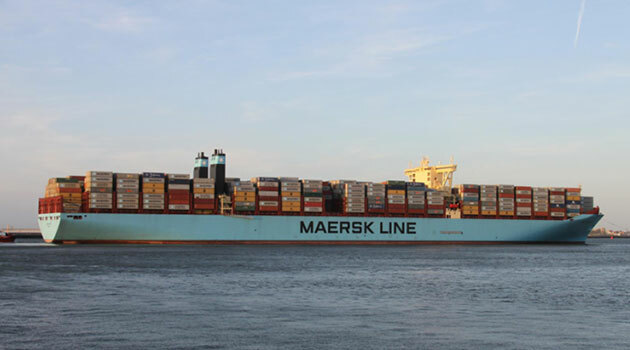 The vessel Margrethe Maersk is arriving at Cai Mep to take goods to carry to Europe. With this direct trip, transport time for Vietnamese goods will be cut by over one day and transport expense by 10-20 percent than the traditional shipping, which has to transit other countries. CMIT managing director Robert Hambleton said the arrival of Margrethe Maersk is a landmark for both CMIT and Vietnam. That proves the capacity of the port and the country, which can become a point of transit for goods from Asia to Europe. Under a plan for seaport development in Vietnam until 2020, the Cai Mep complex of container terminals consists of CMIT, Tan Cang-Cai Mep ODA Terminal and SP-SSA International Terminal. It was designated to be a deep-water port complex able to handle container ships of more than 100,000 DWT. About 1.36 million TEU of goods was handled by the Cai Mep complex in 2015. The volume increased by 47 percent in the following year to more than 2 million TEU. The inclusion of CMIT in the network of terminals eligible for receiving Triple-E vessels by 2M Alliance of Maersk Line and MSC demonstrates the strategic position of the Cai Mep complex, and the successful handling of Margrethe Maersk is also a step to turn this complex into an international point of transit for containers. In October 2016, Lloyd’s List named CMIT as one of the top four port operators in Asia./.